Aug. 29, 2010 -- Michael Gozzo was born in Sicily, and came to the United States to realize his dream. But first, he had to figure out his dream, and that took a little longer than he had originally planned. Gozzo lived for a few years in Connecticut before moving to Los Angeles in the early 1920s, where he found work at a waiter at the newly opened Los Angeles Biltmore Hotel. Gozzo had an old violin at home, which he played for his 5-year-old daughter, Constance. "One day, she asked me why I could not make her a violin," Gozzo recalled in a 1924 article in the Los Angeles Times. "To please her, I rummaged around and found an old box from which I procured a pine board. I worked on this and at last had fashioned a fairly good top. Then I did not know exactly how to proceed and hunted up a regular violin-maker. He gave me some pointers, and also a piece of maple for the back." 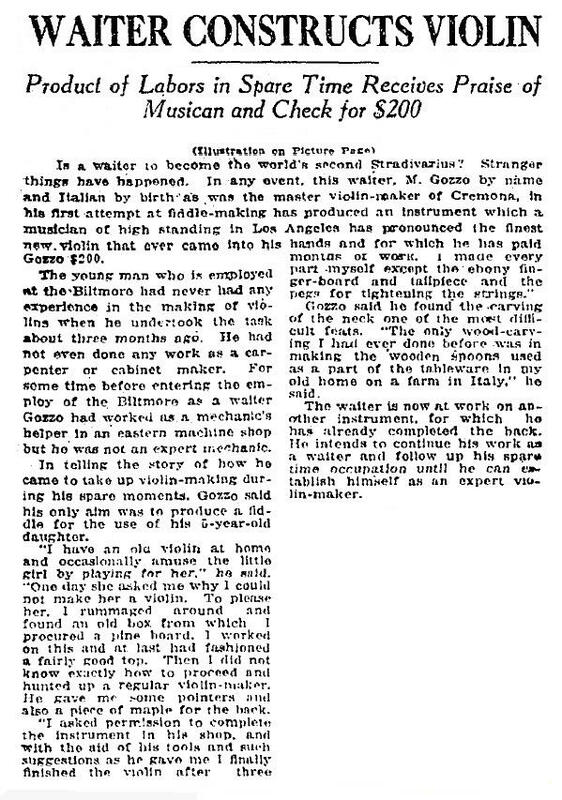 "I asked for permission to complete the instrument in his shop, and with the aid of his tools and such suggestions as he gave me, I finally finished the violin after three months of work," Gozzo said. Until that project, he said, "The only wood-carving I had ever done was in making the wooden spoons used as a part of the tableware in my old home on a farm in Italy." But Gozzo had done a good enough job on his first violin that it was purchased, according to the Times, for $200 -- $2,500 in 2010 -- by "a musician of high standing in Los Angeles," who described the instrument as "the finest new violin that had ever come into his hands." Gozzo continued his job as a waiter, while he worked on his next violin. He was featured in an article in Popular Science magazine in February 1926, titled, "They Do the Unusual -- Some Strange Occupations," as a violin-making waiter. Gozzo returned to Connecticut, where he dug ditches and worked as a laborer in a clock factory and an airplane factory, but he kept making violins in his spare time. 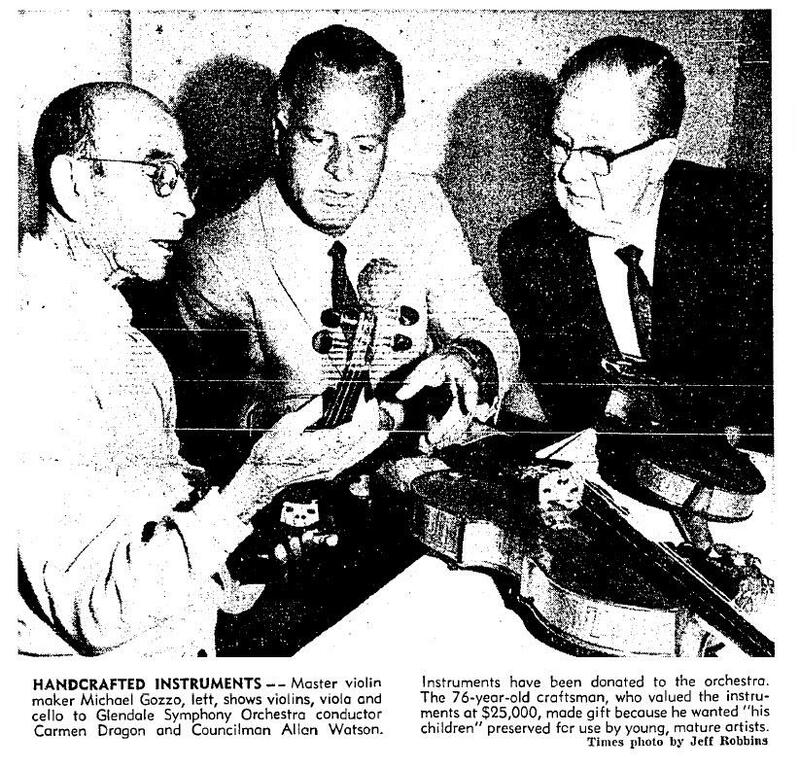 In 1954, he moved back to California, settling in Glendale and opening a tiny shop on a quiet street with a simple sign in the window -- "M. Gozzo -- Master Violin Maker." Gozzo would spend up to a year making each violin, which he sold for $750 to $1,500. In that shop, Gozzo started working on his greatest creation, the George Washington String Quartet, which took him more than 10 years to complete. The quartet is made up of four instruments -- two violins, a voila and a cello. On the head of each instrument is a carved bust of George Washington. Carved on the backs are the images of an eagle, the Statue of Liberty, the U.S. Capitol building, the White House, and the outlined heads of former Presidents Thomas Jefferson, Abraham Lincoln, Woodrow Wilson, Theodore Roosevelt and Franklin Delano Roosevelt. Carved around the edges of the instruments is the inscription, in Gozzo's native Italian, "Vivo so silenzio -- Morto io canto" -- "In life I was silent -- In death, I sing." "I made them in appreciation to be an adopted son of America," said Gozzo, who became a naturalized citizen in 1921. In May 1968, Gozzo donated the George Washington String Quartet to the Glendale Symphony Orchestra. Gozzo, who described the instruments as "my children," said he wanted them "with an organization which will preserve them and make them available for use by young as well as mature artists, thus fulfilling their destiny." Gozzo died three months later, on Aug. 20, 1968, at the age of 76. He is buried at Forest Lawn in Glendale, Calif., in the Slumberland section. On his grave marker is an image of a violin and bow, with the inscription, "Lovely sunny Italy was my childhood home. Profession I had none, till my ambition lured me forth to America to learn my profession, as a violin maker which I knew best. In Slumberland, my tired body forever rest." Gozzo's George Washington String Quartet remained in storage with the Glendale Symphony Orchestra for the next 38 years, until it was brought out to be played and displayed in 2006, at Forest Lawn's Hollywood Hills location. The instruments were part of the "Celebrating Life Through Art, Music & Literature" exhibit, to mark the cemetery's centennial celebration.